Response: After 3 or more characters are commited to a story, discard Hanyatl's 7:13 from the top of your deck and choose 1 non-Ancient One character to go insane, ignoring Willpower or [Terror] icons. Interestingly this can work on offense or defense for a aggro-rush build, and it's one of the only cards that lets you ignore willpower. I always keep looking at this card wondering how I can fit it into my Shub build. I keep having to pass it over though. I will have to try it out one of these days. I've used it a bit. It's a reasonable card, but since it's telegraphed you'll seldom get to use it. More likely you're paying 1 card draw to prevent your opponent from committing more than 2 characters anywhere, which in some situations isn't a bad deal. It's the "ignore willpower" part that stands out as Danigral mentioned, not many things do that. I think we'll see this card get better when there are new cards that interact more with Prophecies. Well, I for one think this card is amazing and can't even think of building a Shub deck without it anymore. It works both offensively and defensively. It's free targeted removal. It ignores willpower and terror. In the worst case scenario, I can bluff it and prevent my opponent from committing to stories. It really shines with Black Dogs and, on a lesser degree, with Masters of the Myths and Shocking Transformations (on defense). On offense, you play it and then innocently commit one character. If no character defends, great! Unopposed and the prophecy will be there on your opponent's turn (watch them sweat when they commit characters to stories that turn). They defend with two? Great! You drive the biggest guy insane and let your guy tear the other one. They defend with one? Even better! You play the doggies, activate the prophecy and eat the remaining one for breakfast. Edit: Oh, I forgot to mention the cool interaction with Y'Golonac. All in all an excellent card, and in my humble opinion the best prophecy yet. Second edit: NVM, the card doesn't work that way. I'm stoopid. When the card says "After 3 or more characters are committed to a story" that means that 3+ guys were committed together. You don't get to add your side plus their side, and characters that add in later like Black Dog don't count towards it either. "are committed" is describing an action, not a population count. It would definitely be a better card if it did work that way though. It's not a bad card, but your opponent won't commit 3+ for you and committing 3+ yourself can be cost-prohibitive although sometimes it's doable and Shub can build a deck that cranks out characters so there's a niche for it. Well, damn. You are right on all accounts. I'm not really sure why I interpreted it that way, but I guess it just stuck and I just didn't bother reading the card again, so thanks for the correction. Let this be a lesson for the future: No matter how well you think you know the game, it always pays to have a look at the rulebook or re-read the cards every once in a while. Perhaps it would be an idea to remind the players in a future episode of The Elder Things podcast. I think dummiesday's instincts were correct. 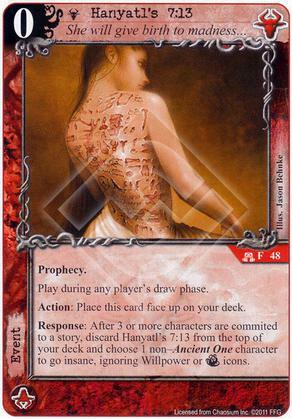 The card reads "After 3 or more characters are committed to a story..." It does not read, "After committing 3 or more characters to a story" or "After a player commits 3 or more characters to a story." Once that third character is committed, regardless of when, my reading is the prophecy is triggered. It's pretty rare for a Response to act in the manner that is being postulated. Responses typically trigger off of momentary occurrences rather than game states. If this card was meant to trigger in the way you're thinking, it would possibly read "trigger this effect only if there are 3 or more characters committed to the same story." See a card like Uroborus, for example. I agree the wording is ambiguous. Given how most Responses work in this game, plus Shub's penchant for flooding the board with characters, I think dboeren is probably correct. Yeah, you're probably right. Ah well, back to the drawing board. This was going to be the centerpiece for my Black Dog/Hastur control deck.